As summer approaches, many parents are looking for activities to keep their children busy instead of staying home the whole day playing with their gadgets or watching telenovelas with their yaya's. It is an ideal time to take a break from the usual school routine, but also an opportunity for students to learn outside of the traditional classroom and pick up new interests along the way. 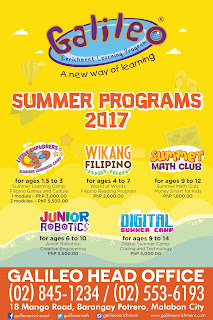 The Summer Learning Camp for 1.5 to 3-year-olds focuses on celebrating Filipino Games and Culture. The two-module program this year offers toddlers the opportunity to practice their social, cognitive, and motor skills in preparation for preschool, through fun and traditional Filipino games such as Sungka, Patintero, and Piko. With the Wikang Filipino Reading Program, students will develop their reading comprehension and vocabulary, along with an appreciation for the country’s culture, with two modules developed using Adarna Publishing House materials. “It is a program that is highly anticipated by the parents in our Center because their children are struggling with their Filipino classes. 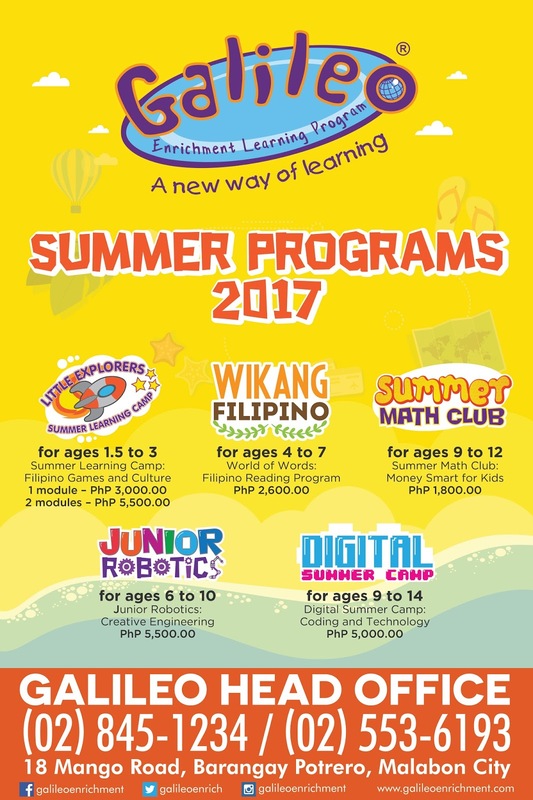 It provides children with an interesting way to learn the language,” says Rowena Palma, Center Director of Galileo Legaspi, Makati City. The Summer Math Club integrates Math concepts to real-life situations, as it aims to enhance students’ mathematical ability, creativity, and critical thinking skills with lessons on money management and entrepreneurship integrated with Math concepts, e.g., basic operations, percentage, decimals, measurement, and graphs. “In the course of the school year, they have been talking about numbers and processes. Galileo’s Summer Camp becomes a summation of what they have learned, along with the avenue to practice the skill,” explains Portia Riveta, Center Director of Galileo Sta. Rosa, Laguna. The Junior Robotics: Creative Engineering classes uses LEGO Education’s WeDo materials and activities to encompass specific subject matter such as Science, Technology, Engineering, Mathematics and Language. This program, which is in collaboration with the Cyberland International Education Centre Singapore, aims to tap in to children’s creativity and combines it with technology as it allows them to construct robot models and program them to move. The Digital Summer Camp: Coding and Technology equips children in the digital age that they live in. The modules are conducted in collaboration with Apple-authorized Power Mac Center, with classes on how to create and animate characters and understand basic programming protocols. “This program prepares students for the digital path, as we facilitate their interest to go beyond simply playing with their devices when they come home from school. This will give them an edge, eventually, as this introduction to coding can help them get ahead in tech-related careers,” explains Paulita Pingul, Center Director for Galileo Balanga City in Bataan. For more information about Galileo Summer Programs and regular School Year Programs, call 8451234 or email info@galileoenrichment.com.